for curvature. Palm area is just an arbitrary rough area of palm to work with measured from the widest point & the longest point. Bear in mind that most of these are bigger than the Shiras and shipping will reflect that. 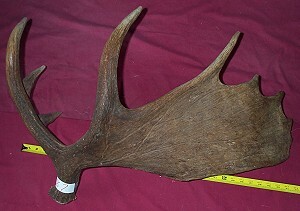 Nice large craft or display antler. Brown back with a light inside.28" overall with an approximate 10"wide palm area.